For the first time ever we ended Chesed Mission with Shabbat. Right before Shabbat, we took a bus to the Old City and walked to the home of Aba and Pamela Clayman and went up to their terrace that has front row seats to Har Habayit. As we took in the breathtaking view, we heard from a group of soldiers and sang songs to welcome in Shabbat. Then we went down to the Kotel for Arbit and Kabalat Shabbat. We then walked back to the hotel where we were joined for Seudat Shabbat by a group of lone soldiers. 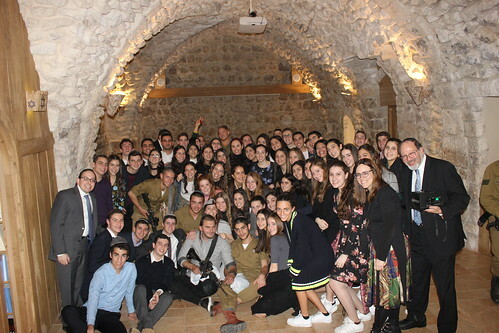 We heard from the soldiers during the meal and then ended the night with a really meaningful tisch where many of us shared what we gained from this incredible week. On Shabbat day, we had our final Inbal breakfast, and then had a break before eating Seudat Shabbat where we heard from Yehuda Benhamu, Susan’s nephew who is a paratrooper. We then walked to the Old City one last time for Seuda Shlishit with soldiers from Thank Israeli Soldiers. We ended Shabbat with a musical havdalah, singing and dancing, and gifts for the soldiers. Then we headed back to the hotel to pack up and leave for the airport. We can’t believe that this life changing week has come to an end. Thank you Rabbi Besser and Susan Franco for everything.